Scouts and campfire programs are a timeless combination. 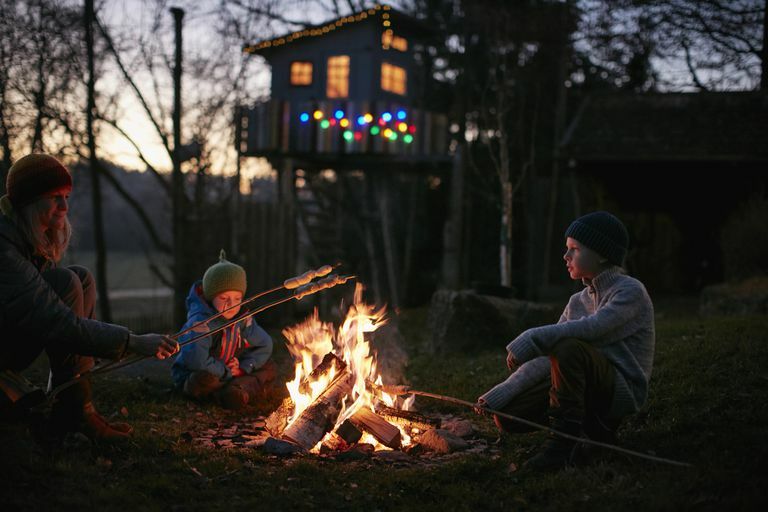 While they are historically linked to Cub and Boy Scouts of America troops, Girl Scout troops have become more involved in planning campfire programs and enjoying the benefits. Whether performing, helping in the background, or just watching, campfire programs offer Scouts of all ages the opportunity to get involved, express themselves, and learn a bit more about their peers and themselves. A campfire program is a gathering of Scouts, troop leaders, and family members for fun and fellowship. Despite its name, it doesn't have to take place at night, nor does it have to include an actual fire. Songs: Sing all kinds of songs, from silly Scouting songs to the National Anthem. Stunts: Both pre-planned and improvised skits work great as stunts; invite some audience participation to make things really interesting. Stories: Whether they're funny or scary, stories are a vital part of campfires. Showmanship: Great opening and closing ceremonies add some flair to your event and can include a creative way to light the campfire (if you're using one). There are numerous benefits to holding a campfire program. It gives every Scout the opportunity to participate in a group activity and potentially discover a new interest or talent. Even if they don't want to perform, they can be given a behind-the-scenes role, such as managing the props or holding the microphone for the Scouts with speaking parts. Campfire programs give Scouts a forum to practice their public speaking skills. Whether they are memorizing lines or ad-libbing, they will be learning how to speak in front of a group, which is a skill that will serve them well in adulthood. Scouts also have the chance to tap into their creativity as they plan their contribution to the campfire program. Some may want to strictly follow a pre-existing script for a skit or read a favorite story, but others will want to add their own personal touches in creating original writings and/or performing something they make up themselves. Whether outgoing or shy, there's a role for every Scout in a campfire program, so encourage everyone to get involved. A good campfire program lasts about 45 to 60 minutes. This is long enough to keep everyone's attention, but not so long that the Scouts become restless. Though a fire isn't necessary, having one is helpful as "following the flames" can help you pace things. When the campfire flame is high, there should be lots of energy in your campfire; this is the best time for your audience participation songs and skits. As the fire burns down, the mood should come down, too. Slower songs, calmer stories, and a short inspirational leader "minute" talk will wind down the campfire and naturally bring the event to a close. To have a memorable and enjoyable campfire program, it is imperative that you plan it in advance. Prior planning will help ensure that your program runs smoothly and that everyone can be ready for their turn on the campfire stage. There are some skit topics that fall into a "gray area" where leaders should use their judgment about the appropriateness of the skit, like avoiding "potty humor" that many young children are fond of. Scout leaders should think about whether the skit will uphold the Boy Scouts of America's Scout Oath and Law or the Girl Scout Promise and Law. Two great resources to help you plan a memorable campfire program are the BSA's Campfire Program Planner and the Girl Scouts of Central Maryland Council’s Campfire Resource Book. They both provide a form to use while planning your event and offer ideas that either Boy or Girl Scout troops would enjoy. An important bonding experience that no Scout will soon forget, campfire programs are a longstanding tradition that can be customized to suit the needs and talents of your individual Scouts and troop.